In late 2014, with mixed emotions, Disney guests bid farewell to four beloved acts from around the World Showcase at Epcot. While we loved–and would surely miss these shows–we understood the need to refresh the entertainment atmosphere around World Showcase with new acts and experiences to fully immerse us in the culture of each country represented there. Since then, Disney introduced several new entertainment experiences to replace the old ones, and a few new ones were also added to enhance what remained. On my recent visit, I made a point to see all of these new performances and compare how I felt they stacked up to my old favorites. Off Kilter has always been my favorite band in all the world of Disney. So, my first stop was The Mill Stage in the Canada Pavilion, where the new Canadian Lumberjacks demonstration was. Right away, I noticed that the bench seating was missing and there was a huge, chest high “pool” added to the front, right of the stage, where some of the viewing area used to be. This show basically demonstrates lumberjack skills where a blue team and a red team are pitted against one another to earn points and “win the match.” There is competitive axe-throwing, crosscut sawing, wood carving with chainsaws, speed cutting and a log rolling competition in the pool. 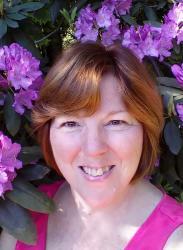 The show is emceed by a host with a bit of a comedy routine and some history interjected into the performance. And, of course, there is mention of environmental responsibility. For every tree forested, for example, there are 3 planted and the trees used in this show are mulched for use in the parks. When it was all said and done, I did not find this show particularly engaging. I noticed guests stopping, but not sticking around. I felt that this show was better suited as a short term exhibition at something like a fair. I can’t imagine this interesting me more than once. You can see this demonstration and assess it for yourself daily at 12:00. 1:15, 2:15, 3:50, 5:00 & 6:15pm. The length of the show is about 20 minutes. 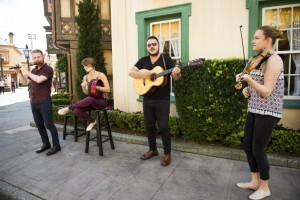 The World Showcase Players were replaced by The Paul McKenna Band from Glasgow, Scotland. You can’t get much more authentic than that! This four piece band is led by Paul McKenna on guitar. He is accompanied by a percussionist, flute, and violin player. They play folk and traditional Scottish music with a contemporary twist. Their lilting melody drew us around the corner, where we found them playing outside the Crown and Crest shop in the United Kingdom. And, indeed, it was planned that guests would “simply” stumble upon this show in just this way. It feels so casual and spontaneous, that you feel like you’ve walked into a private session and you’re the only one there. I really enjoyed the fresh, clear sound of this band. And, in all honesty, I didn’t miss the former Players at all. Disney did good here! You can see this band perform Wednesday through Sunday at 12:10, 1:10, 2:10, 3:10, 4:00, 5:00 & 6:00pm. The length of the show is about 15 minutes. Another act new act for Epcot’s World Showcase is B’net Al Houwariyate. 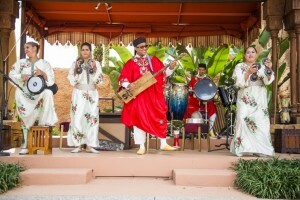 This musicalgroup replaces Mo’Rockin’ at the Morocco Pavilion. 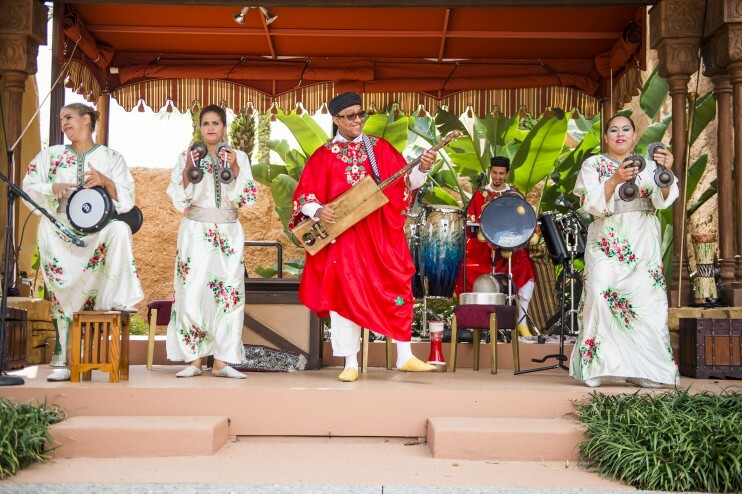 This is an internationally-acclaimed ensemble of female performers, who play traditional instruments while dancing and performing songs that are based on Moroccan traditions. Musical styles include Berberchants, urban Marrakesh beats, and the Andalucian rhythms that inspired Spanish Flamenco. All very true to their Moroccan heritage. Although this was a lively show and the audience around me seemed to be enjoying themselves, it did not get anyone out of their seats as I have seen Mo’Rockin’ do in the past. And, sorry guys, no more belly dancer! This group performs Wednesday through Sunday at 1:20, 2:40, 3:35, 4:40, 5:40, 6:40 & 7:40pm. The length of the show is about 25 minutes. While taking photos in Italy, we were startled by the energetic shouting and drumming to announce the arrival of the all new Sbandieratori Di Sansepolcre (the Flag Wavers of Sansepolcro). This show is an addition to the entertainment in Italy, not a replacement. They are a band of four flag-twirling men accompanied by two drummers and three trumpeters. 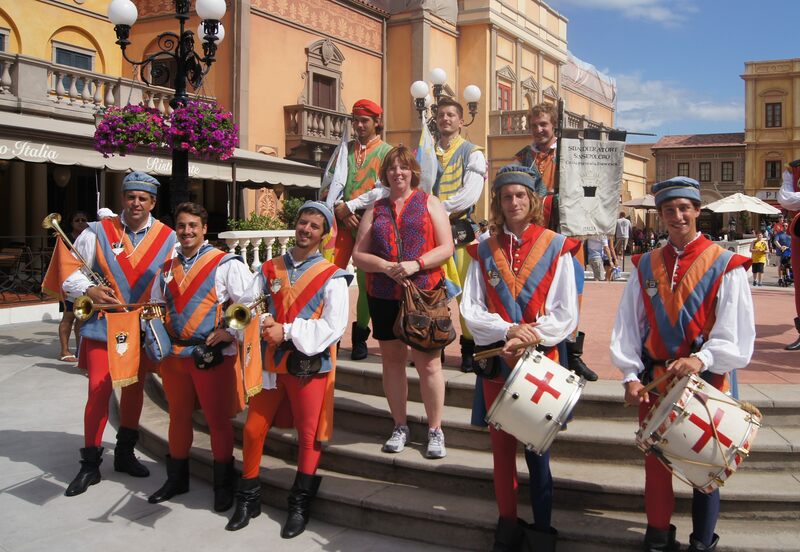 They are from a small city in central Italy known for their artistic flag waving traditions. The performance brought to mind the color guard groups I’ve seen with marching bands. It certainly caught and captured our attention as well as anyone passing by. I saw far more audience interest here than at the lumberjack demonstration. On a personal note, there was one instance of audience participation that absolutely pleased me. The troupe was pulling guests up to learn how to throw a flag; particularly, lovely young girls as they were all handsome young men, of course. One mother sort of pushed her special needs son into the group, in spite of her husbands urging her to stop. This resulted in having one more guest than was called for. The troupe graciously included the young man in the performance with one of the flag throwers helping him one on one. It was a lovely, special moment and I’m sure it made the day for that mother and her son. It is that kind of Disney magic that keeps me going back year after year! I hope this show sticks around. It really was beautiful to see those colorful flags flying into the air against the blue Florida sky! You can see this group perform daily at 3:00, 4:00, 5:00. 6:15 & 7:30pm. The length of this show is about 15 minutes. 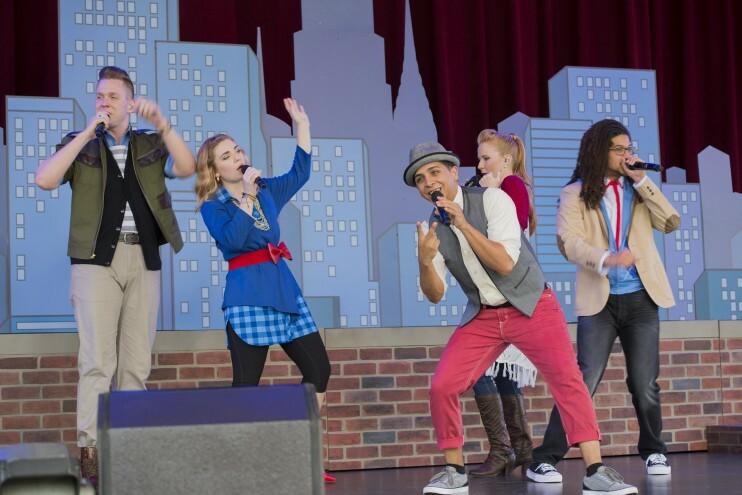 The final addition to the World Showcase line up at Epcot is the American Music Machine. I loved, loved, loved this performance! This is a five-member contemporary a cappella group performing at America Gardens Theatre. What is a cappella you ask? It is a unique style of music using only the human voice…no instruments. You would be hard pressed to tell the difference between actual percussion and the beat boxing in this group! American Music Machine’s repertoire includes classic songs as well as contemporary. As the group says, “that conveys the global influence of American popular music.” It is no wonder the group’s performance is so fine tuned, as it has been arranged by none other than Tim Davis who worked on the hit television show “Glee.” Now you know what I’m talking about ; >) I only wish the show had been longer! Look for American Music Machine Wednesday through Sunday at 12:45, 1:30, 3:00, 3:45 & 5:00pm. The length of this show is about 20 minutes. All in all, the World Showcase at Epcot has gone through an entertainment renaissance, with almost every pavilion introducing something new. Be it lumberjacks in Canada, a more classic sound in Morocco, or something as unique as flag throwers in Italy, each new addition has brought a more authentic touch to each of the areas they represent. 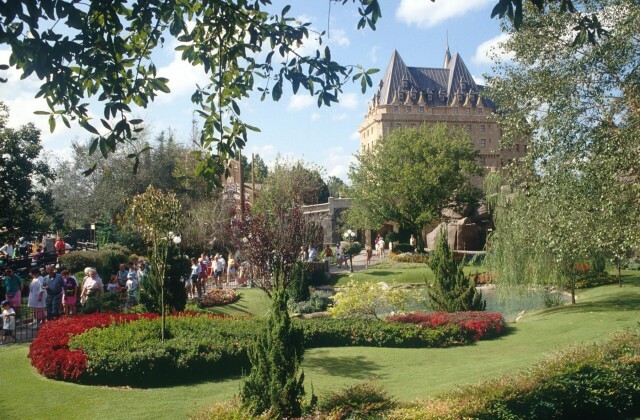 So, on your next visit, make sure you take a little time…or the entire day…to experience all the entertainment offerings around the World Showcase. Let me know what you think of the offerings. And, don’t forget to ask your favorite Our Laughing Place travel pixie to help you with your plans!